Severe weather challenges all of us. Activities that we take for granted can become difficult or even hazardous when severe weather occurs. However, by taking some simple steps to prepare each winter you can reduce the impact of such events. The Government annually launch a Be Winter Ready information campaign, which accompanied by the winter-ready booklet, gives information on being prepared, providing practical advice for coping during episodes of severe weather, as well as giving contact details of organisations and agencies that can provide guidance and assistance. The booklet and website was prepared by the Government Task Force on Emergency Planning and the main message is simple - be prepared, stay safe and know where to find help should you need it. 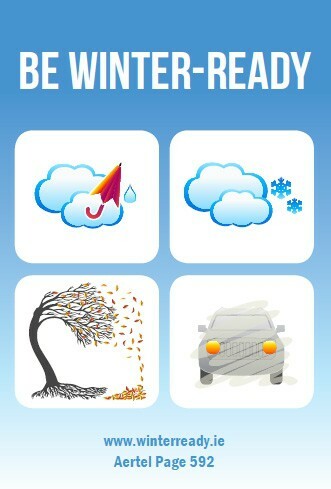 An electronic version of the Be Winter Ready booklet is available along with other information, advice and links on the website www.winterready.ie in both Irish and English. The Website also acts as an entry site to many other useful websites.